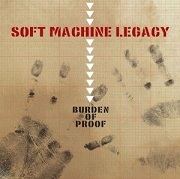 Review: "Soft Machine Legacy: Burden of Proof" - Sea of Tranquility - The Web Destination for Progressive Music! Keeping the same line-up intact from their Live Adventures album from a few years ago, Soft Machine Legacy return with their first studio set since 2007's Steam. John Etheridge (guitar), Theo Travis (tenor sax, flute, Fender Rhodes Electric Piano), Roy Babbington (bass), and John Marshall (drums) obviously have plenty of history in both jazz-fusion and progressive rock (Soft Machine, Nucleus, Keith Tippett Group, The Tangent, Jade Warrior, Steven Wilson, and Robert Fripp just to name a few of the bands & artists these guys have played with), so it's no surprise that Burden of Proof is a stellar recording filled with classy, adventurous sounds, impeccable playing, and engaging arrangements. We'd expect no less from this band to be honest. As in the past, both Etheridge & Travis lead the charge with their impressive lead excursions and complex melodies. Both of these players stepped in for legends in the past (Etheridge for Allan Holdsworth in Soft Machine back in 1975, and Travis for the late Elton Dean in 2006), so they are no strangers to taking on the focal point in the band, with trusty veterans Babbington and Marshall holding down the steady and at times tricky rhythms. Opening title cut "Burden of Proof" starts things off in blazing fashion, a real tour-de-force for the entire band, before the more atmospheric & bleak "Voyage Beyond Seven" sets in, complete with liquid guitar lines from Etheridge and Travis' haunting flute. The guitarists solo piece "Kitto" is mysterious, and quite enchanting, as he hits on tones that we'd normally hear from the likes of Pat Metheny, Terje Rypdal, and Bill Frissell, , while the rousing "Pie Chart" is smoky, sultry bluesy jazz at it's best, with Travis' snaking, sleazy saxophone dueling it out with Etheridge's bubbling bues-rock solos. "JSP" is a quick little Marshall drum barrage, leading into the mysterious and intoxicating "Kings and Queens", easily the most 'prog-rock' styled piece here, as Babbington's addictive bass throbs underneath gentle guitar chords and Travis's soaring flute and keyboard washes. Look for a real tasty guitar solo on this one as well, and when paired up with the flute the results are almost like vintage Camel. "Fallout" is like a meeting of King Crimson and Soft Machine, as weaving sax, guitar and bass melodies lead into a frenzy of cascading riffs and solos from the group for a wild ride of prog rock, fusion, and free jazz. On "Black and Crimson", the band go for a more melody driven tune, as Etheridge's vibrato driven lines have an almost Carlos Santana feel to them, and "The Brief" is quick little drum & sax blast, with Marshall & Travis coming close to free-jazz experimentation. The real surprise here is the hard rocking "Pump Room", a real riff driven piece that showcases Etheridge's thick chords upfront with husky sax melodies from Travis. It's menacing and nasty, and when the guitarist unleashes some distorted, whammy bar driven leads, it's blazingly good fun! The CD closes with the avant-garde "Green Cubes" (noise, noise, and lots of delicious noise!) and the meditative "They Landed on a Hill", each one a polar opposite of the other but both mesmerizing in their own way. Burden of Proof is, to put it mildly, absolutely exquisite. These are four musicians who are masters of their craft, and truly at the top of their game, not only as soloists but as contributors in an actual band. They've put together here a collection of songs that basically has something for everyone; challenging jazz-fusion, adventurous prog-rock, bits of chaotic free-jazz, atmospheric instrumental pop-jazz, and even a little hard rock. Extraordinary!